Revised on Nov 7 at 12:04 p.m. 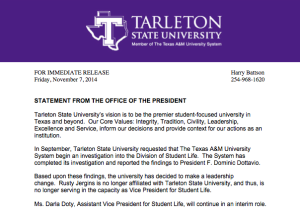 Since early September, Vice President of Student Life Rusty Jergins has been under investigation by the Texas A&M University System. 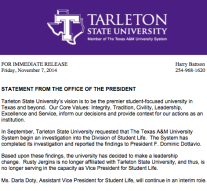 Little information about the investigation has been released as it was ongoing, but today a statement was released from the office of the president stating that the investigation has been completed and findings from it have been reported to President Dottavio. 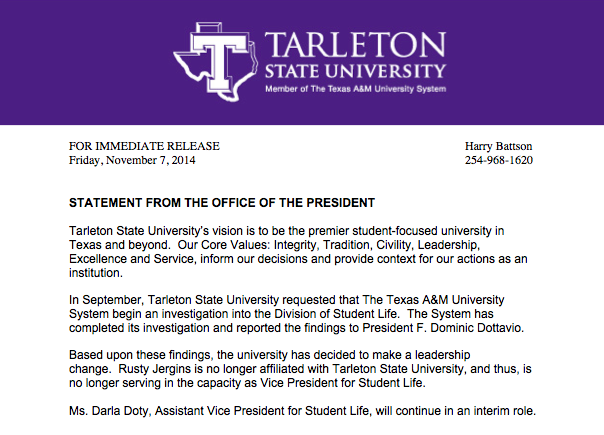 The statement said that based on the findings from this investigation, a leadership change was in order, and now Rusty Jergins is no longer affiliated with Tarleton State University and no longer serving as Vice President of Student Life. Darla Doty, Assistant Vice President for Student Life, who has been covering the role in his stead will continue as interim vice president. No further information about the details of the investigation have been released. Texan News Service will continue to release information about the story as it becomes available. President Dottavio released the notification by email at 11:11 a.m. today. Texan News Service received the statement at 11:11 a.m. on Nov. 7.